Worm:iPhoneOS/Ikee is the first worm to target the Apple iPhone. Its most notable action involves changing the background wallpaper on the device. The details below are for the A variant of the Ikee worm. It was first reported by iPhone users in Australia and appears to have been written a hacker named 'ikex'. Though this variant is non-malicious, it is still considered of interest as it is possible for another hacker to use code from this variant and adapt it to carry a more sinister payload - as subsequently happened with the Worm:iPhoneOs/Ikee.B outbreak. In addition, accessing a user's computing device and changing their data without permission is illegal in many countries. Users who have not jailbroken their iPhones, do have have an SSH application installed, or have changed the default SSH password are not affected. 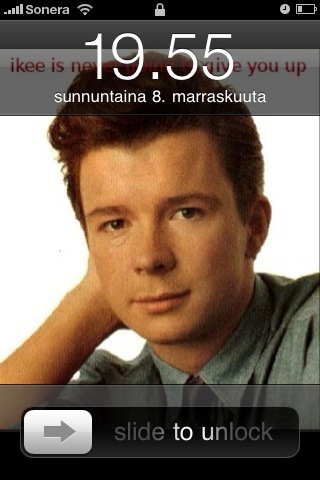 While active, the worm changes the background wallpaper displayed when the iPhone is locked to an image of 1980's pop star Rick Astley. It also displays the message: "ikee is never going to give you up". The act of covertly using Astley's image in this manner is a known Internet meme, and a user who has been unintentionally subjected to it is said to have been 'Rickrolled'. Once in place, the worm appears to attempt to find other iPhones on the mobile phone network that are similarly vulnerable. If found, the worm installs itself on the new device.